Often called the “Venice of the North,” Stockholm is a visually impressive city built on 14 islands linked by waterways and bridges. Even Venetians residing in the Stockholm of the South would probably agree the Baltic Sea archipelago is well worth a visit—if not for its nickname. 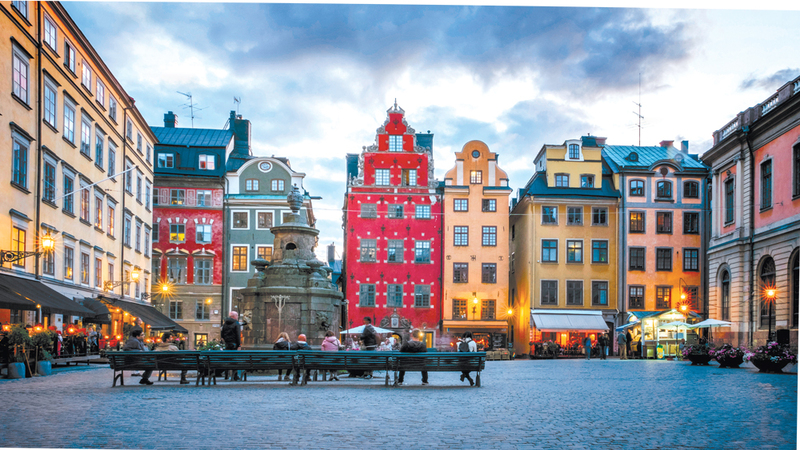 An efficient public transport system and a compact city center make it easy to navigate Stockholm’s charms, of which there are many—the locals for one. Often dismissed (along with their fellow Scandinavians) as stoic and humorless, Swedes love a good laugh as much as anyone. Note: the same subtlety that has made Swedish design so popular across the world extends to wry jokes that may slip past anyone not paying attention. In Scandinavia, summer is a season to rejoice in nature and the outdoors and the hardy Swedes hold the same regard for winter. If cross-country skiing across Stockholm’s expansive parklands does not appeal, the Scandinavian tradition of indoor coziness provides a comforting alternative. Candles glow brightly during the dark winter days—atmospheric warmth beams through windows around the city’s picturesque Gamla Stan (Old Town). Winter is also the time when the world’s intellectual elite turn their attention to Stockholm for the Nobel Prizes. Born into a privileged Swedish family in 1833, Alfred Nobel was a technical genius. He perpetuated Sweden’s general reputation as a country known for its explosives. The most famous of Nobel’s inventions is dynamite, a substance he created to facilitate the construction of bridges, tunnels and rails at a time when infrastructure development was a high priority for many nations around the world. As a result, he became a fabulously wealthy man—though he once said, “Contentment is the only real wealth.” Equal parts humanist and industrialist, the Swedish inventor is better known in death since the foundation bearing his name distributes eminent prizes in his honor every year on Dec 10—the anniversary of his death. As stipulated in his will, the Nobel Prizes are awarded to honor outstanding professional achievement. Nobel nominated five specific fields of human endeavor because they were the ones he felt had the most impact on humanity: physics, chemistry, medicine, literature and peace. The prizes are awarded in the imposing Stockholm Concert Hall (all except the Noble Peace Prize, which is awarded during a ceremony in Oslo, Norway, on the same day). Guests move on to Stockholm City Hall for dinner and the reception that follows the ceremony. City Hall’s austere outward appearance isn’t reflected inside. The expansive Blue Hall (the walls are actually red brick) and glittering Golden Hall are the locations of the banquet and gala where 1,300 people partake in the post-ceremony festivities. Originally planned as an open-air piazza in accordance with the building’s Italianate style, the architect was forced to concede to the rigors of Northern European weather and the building’s central piazza was roofed over to create the Blue Hall. The brilliant mosaic that dominates the Golden Hall is composed of 18 million pieces of gold and glass. Guided tours of Stockholm City Hall take place throughout the day and are among the most popular activities for visitors to the Swedish capital. Private tours are available by request. For those interested in potential for greatness realized, The Nobel Museum located in the square in Gamla Stan is fascinating. The small museum showcases superb displays presenting the history of Nobel Prizes and the laureates’ backgrounds. 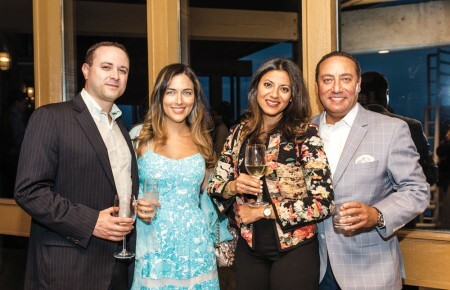 The museum is not all pomp and circumstance as the annual ceremony and gala may suggest. (Check the undersides of the chairs in the café. They’re all signed by Nobel winners). The square is also home to Stockholm’s most atmospheric Christmas fair, a fitting representation of the respect for tradition and wintertime camaraderie that are integral to the Swedish ethos. 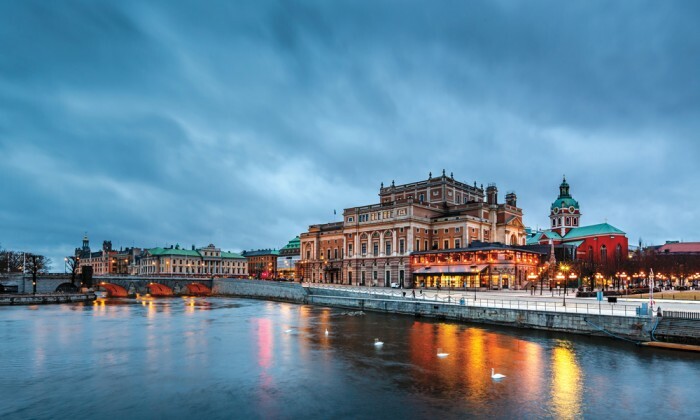 The current Nobel Museum will eventually be replaced by a spectacular new Nobel Center in Stockholm’s Blasieholmen district, the location of Grand Hotel that’s renowned as much for its annual hosting of the Nobel laureates as for the eponymous film starring Greta Garbo. Beginning in 1901—the first year the Nobel Prizes were awarded—Grand Hotel was the site of the ceremonies and banquets until the event outgrew the splendid Hall Of Mirrors. More than 100 years later, Grand Hotel lives up to its name, providing comfortable accommodations and polished service for its guests. 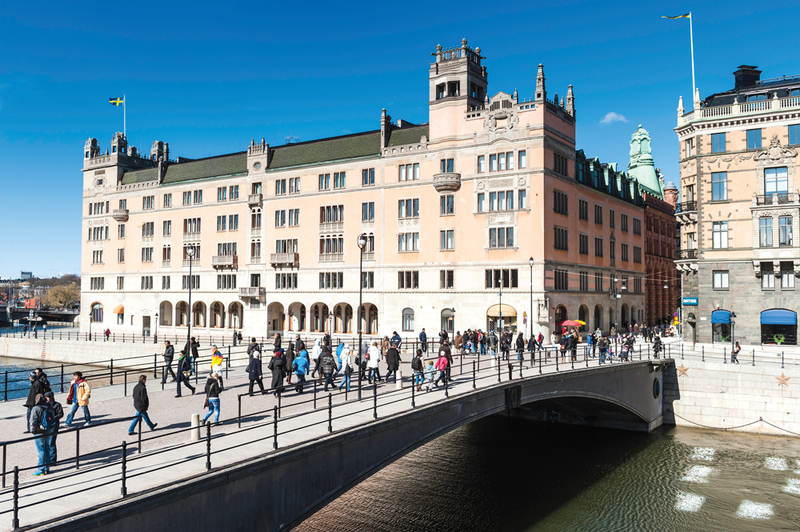 The hotel’s recent refurbishment of guestrooms and public spaces has brought it up to date to meet the needs of Stockholm’s growing number of visitors. Grand also incorporates another Swedish December tradition into Nobel winners’ experiences by having them awakened on Dec 13 by the song of Santa Lucia. The Italian saint is revered in Sweden because of the historical associations between these two cultured countries that was first created when Sweden’s 17th century Queen Christina moved to Rome and made great efforts to support the arts. This trait was continued by her successor King Gustav III and is carried on to this day by the Swedish royal family. If the sedate Grand Hotel is the hotel of choice for the conservative establishment, the effervescent Berns (just a few hundred yards away) attracts a different but no less shabby clientele. The boutique hotel is a favorite of guests from the worlds of music and fashion. Rihanna, Bill Gates, Noomi Rapace (The Girl with the Dragon Tattoo) and the Dalai Lama have all passed through the doors. Berns occupies a beautifully restored historic building on the edge of Berzelii Park where the promontory of Blasieholmen joins the rest of the city. 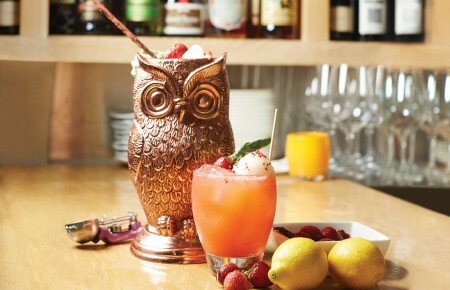 It’s is rooted among the hippest locales in this Nordic Eden. 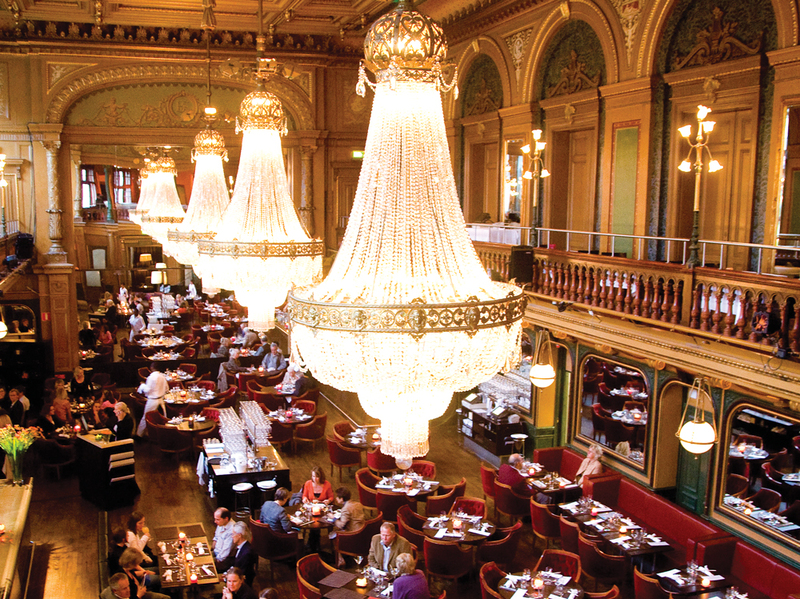 The park side Berns Bistro provides some of Stockholm’s most exciting culinary experiences, where French classics like steak tartare are enjoyed to the tunes of the local French radio station playing throughout the day. One of the city’s best Asian restaurants is Berns Asiatiska, which occupies a glorious 19th century dining hall refurbished in an eclectic contemporary style. Berns Asiatiska keeps in theme with the Berns-managed China Theatre next door. The theater is one of the most intimate performance spaces in town but still manages to lure top names. Royal Swedish Opera is also close to both hotels. It’s a cultural oasis where classic opera and ballet performances share the stage with contemporary interpretations of the same. Stockholm is a city endowed with many wonderful small museums. 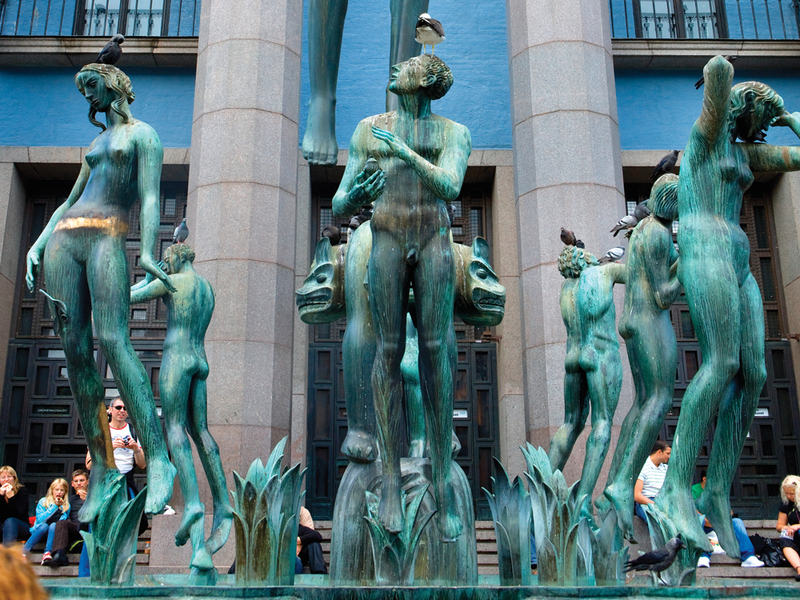 The remarkable Millesgården is the former studio and residence of sculptor Carl Milles. Milles is better known in the art world, and the world in general, than most other Scandinavian sculptors. He lived in America for 20 years as head of the department of sculpture at the Cranbrook Academy of Art in Michigan and left an impressive body of work in his adopted country, including his wood sculpture “Man And Nature” at 1 Rockefeller Plaza. Before his death in 1955, Milles returned to his villa on Lidingö (Liding Island) just outside Stockholm. Here, on the splendid stone-paved terraces overlooking the water, Milles’ sculptures are seen as they were meant to be seen: outdoors against the sky. The Thiel Gallery, Prins Eugens Waldemarsudde and the Hallwyl Museum are all former homes of wealthy Swedes with notable collections. The Thiel Gallery—occupying a patrician mansion in a bucolic setting a few miles from downtown Stockholm—houses an outstanding art collection in addition to valuable art nouveau furniture. Along the route to the Thiel Gallery is Prins Eugens Waldemarsudde. A charismatic prince had a large house built with top floor studio space for his artistic endeavors. The beautiful Hallwyl Museum is one of Stockholm’s most eccentric and engaging. Objets d’art include personal peculiarities such as a chunk of the former owner’s beard. Complementing these small museums are larger institutions such as the Nordic Museum, the Maritime Museum, the National Museum of Art (currently under restoration), the Modern Museum of Art and the impressive Museum of Far Eastern Antiquities—one of the largest of its kind in Europe. The Modern and Far Eastern Antiquities museums are located on the small island of Skeppsholmen, connected by a short bridge to the Blasieholmen district. In the Old Town, the massive Royal Palace (today used mainly for official functions) houses several museums such as the Royal Apartments, the Royal Treasury and King Gustav III’s Museum Of Antiquities—though it can be said that the atmospheric streets and lanes of the Old Town themselves constitute one big, open-air museum. The embankment next to City Hall is the departure point for trips to Drottningholm Palace, among the most popular of Stockholm’s many boat excursions. As the official residence of the Swedish royal family, Drottningholm Palace is typically rich in its architecture and décor and well worth a visit. Special performances here at the Palace’s theater are exceptional in that it is a royal theater open to the general public. Opened in 1791, it is the only original Baroque theater in the world still in operation and—together with the palace building and the Chinese Pavilion located in the royal park—is a UNESCO World Heritage Site. The boat ride and entrance tickets to all three buildings are included on a Stockholm Pass, which provides entry into most of the city’s top attractions. It has never been easier to reach Stockholm from New York than it is now with Norwegian Air Shuttle. Norwegian is the only airline to offer non-stop service between JFK and Stockholm’s Arlanda Airport. The ultraconvenient Arlanda Express train service links Arlanda to Stockholm’s Central Station in a quick 20 minutes, making it the fastest and most efficient way to reach the city.